Vineet is a first-generation Entrepreneur. He has led the global top-ten advertising agency TBWA as its Indian CEO. This made him perhaps the youngest ever CEO of a multinational advertising network in the country. He has written three best-selling management and inspirational books-Build from scratch, The street to the highway and The 30 Something CEO. He is an avid swimmer, a gaming enthusiast, a bonfire guitarist and a road-trip junkie. 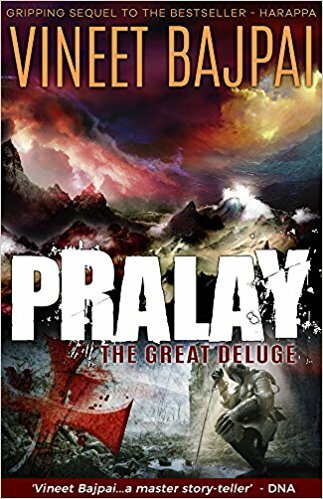 Pralay: The Great Deluge (Harappa) is a part of series which focuses on ancient bloodlines. It intertwines the present days to a mythological past. The chapters oscillate between the present and the past. The book has history, mythology, occult, mercenaries and all served with a modern take. The chapters oscillate between the past and the present. It picks off right from where the author had left, with a little recap, which comes as fresh air. Vivasan Pujari, one of the main protagonist, the half-human and half-god is now a demon thirsty to seek revenge, assuming his beloved Sanjana and his only son Manu are killed. While on the other hand, the creator has plans of his own. Vivasan Pujari, in rage, commits grave mistakes and is cursed for generations. In parallel, Vidyut, the last devta on earth, betrayed by his close childhood friend badly injured emotionally and physically from betrayal and combat respectively. As he recovers slowly, many events take place and along with that he also learns a lot of things about his past, the sinister New Order, who desperately want Vidyut dead. The storyline shows Vidyut catching up with the events that happened in his forefather’s lives and how it shaped his destiny while also preparing to bring the evil down. I received the first part of the trilogy- Harappa – Curse of the Blood River as a review copy and was waiting for the book next in line. When I saw the book on Amazon, I put it on my wishlist and say Deja Vu, I received a request email to review the second part of the book. Book in exchange for an honest review. The book had a quick recap, which was good. I am kinda paranoid about the sequels because they tend to go bleak after a bright prequel. The author did not disappoint with the second book. It was as engaging and fast-paced as the second book. The language subtle and simple. Well researched and well portrayed. The storyline, a lot of plots and subplots but not confusing, easy on the eyes and mind. At a place or two, the description of the situation went a little off the board and was more than necessary. Of the many Indian authors, I have read, Bajpai’s are really good and worth the time. Completely unputdownable and will leave you craving for more. The only disappointing thing is the wait for the next book! Overall it is an amazing read. Do read the first part before you pick up this book. Overall, I rate this book a 4/5. This Book Review is a part of “The Readers Cosmos Book Review Program and Book Promotions” To know more click here. Sounds like a good book, Ramya. I might pick it up next after I finish my present one – ‘The Help’. It’s that good? I need to get to it – the first one first, of course. I enjoy reading about mythology but there are so many of them around these days that it becomes difficult to get to them all. Thanks for pointing me to this one.